Benralizumab (Fasenra) for Severe Eosinophilic Asthma | The Medical Letter, Inc.
Revised 5/1/18: Information in the Dosage section regarding hypersensitivity reactions was revised. MECHANISM OF ACTION — Severe asthma often has an eosinophilic phenotype with elevated blood and lung eosinophil levels.3,4 IL-5 is the major cytokine responsible for the growth, differentiation, recruitment, activation, and survival of eosinophils. Mepolizumab and reslizumab, the two previously approved anti-IL-5 antibodies, reduce the production and survival of eosinophils by binding to IL-5, preventing it from binding to its receptors. Benralizumab binds directly to the IL-5 receptor, preventing IL-5 binding and causing apoptosis of eosinophils and basophils through cell-mediated cytotoxicity. All three of these agents decrease eosinophilic airway inflammation. CLINICAL STUDIES — Two randomized, double-blind, placebo-controlled, phase 3 trials, SIROCCO (48 weeks) and CALIMA (56 weeks), evaluated the efficacy of add-on therapy with benralizumab 30 mg SC every 4 weeks or every 4 weeks for the first 3 doses and then every 8 weeks in patients 12-75 years old with severe uncontrolled asthma and baseline blood eosinophil counts ≥300 cells/μL who were taking a high-dose inhaled corticosteroid and a long-acting beta2-agonist (LABA), with or without additional asthma-controller medications.5,6 Patients in both trials must have had ≥2 asthma exacerbations requiring either systemic corticosteroid treatment or a temporary increase in their usual maintenance oral corticosteroid dosage within one year before enrollment. 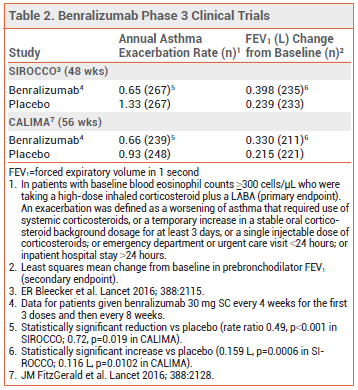 In both trials, benralizumab significantly reduced annual asthma exacerbation rates and improved forced expiratory volume in one second (FEV1) (see Table 2). It also modestly improved patient-reported asthma symptom scores. A double-blind, 28-week trial (ZONDA) evaluated the oral corticosteroid-sparing effect of benralizumab in 220 adults with severe eosinophilic asthma who were taking a high-dose inhaled corticosteroid plus a LABA, with or without other asthma-controller medications, and had been on oral corticosteroids for at least 6 months prior to enrollment.7 Patients were randomized to receive add-on therapy with placebo or benralizumab 30 mg SC every 4 weeks or every 4 weeks for the first 3 doses and then every 8 weeks. The dose of the oral corticosteroid (prednisone or prednisolone) was reduced gradually over a 20-week period by 2.5-5 mg every 4 weeks in patients who met specific criteria for maintenance of asthma control. At 28 weeks, the median reduction in the daily oral corticosteroid dose, the primary endpoint, was significantly greater with benralizumab than with placebo (75% for both benralizumab regimens vs 25% for placebo). The change in FEV1 from baseline was measured at 4-week intervals; there was a significant increase with both benralizumab regimens compared to placebo from 4 to 20 weeks, but not at 28 weeks. Total asthma symptom scores decreased slightly from baseline to the end of therapy in all groups, and were not significantly different between benralizumab and placebo. ADVERSE EFFECTS — In clinical trials, adverse effects were generally reported at similar rates with benralizumab and placebo. Injection-site reactions occurred in 2.2% of patients treated with benralizumab in the SIROCCO and CALIMA trials. Hypersensitivity reactions, including urticaria, angioedema, rash, and anaphylaxis, have occurred rarely with benralizumab. Antibodies to benralizumab developed in 13% of patients; they did not appear to affect the efficacy or safety of the drug, but high anti-drug antibody titers were associated with increased clearance of benralizumab and higher blood eosinophil levels. PREGNANCY AND LACTATION — There are no adequate studies of benralizumab use in pregnant women. Monoclonal antibodies such as benralizumab can cross the placenta during the third trimester. In one study, cynomolgus monkeys were given IV benralizumab every 2 weeks throughout pregnancy in doses that produced exposures up to 310 times those achieved with the maximum recommended human dose. No harmful effects were observed on the fetus or on neonatal growth up to 6.5 months after birth. There are no data on the presence of benralizumab in human breast milk or on its effects on the breastfed infant or on milk production. DOSAGE AND ADMINISTRATION — Fasenra is available in single-dose, prefilled syringes containing 30 mg of benralizumab. The recommended dosage is 30 mg injected subcutaneously into the upper arm, thigh, or abdomen every 4 weeks for the first 3 doses, and then every 8 weeks thereafter. The optimal duration of treatment is unclear. Hypersensitivity reactions can occur hours or days after administration of the drug. Benralizumab should be administered by a healthcare professional and the patient should be monitored for adverse effects after each dose. Although not recommended in the labeling, it might be prudent for patients to carry an epinephrine auto-injector (Auvi-Q, EpiPen, and others) and be trained in its use. CONCLUSION — The anti-interleukin-5 (IL-5) monoclonal antibody benralizumab (Fasenra) can reduce asthma exacerbations and improve lung function in patients with poorly controlled severe asthma and elevated eosinophil levels. No head-to-head trials comparing benralizumab with the anti-IL-5 antibodies mepolizumab (Nucala) and reslizumab (Cinqair) are available. Benralizumab is given about half as often as mepolizumab and reslizumab, but costs about twice as much per dose, so treatment costs are similarly high with all three drugs. Mepolizumab (Nucala) for severe eosinophilic asthma. Med Lett Drugs Ther 2016; 58:11. Reslizumab (Cinqair) for severe eosinophilic asthma. Med Lett Drugs Ther 2016; 58:81. HH Walford and TA Doherty. Diagnosis and management of eosinophilic asthma: a US perspective. J Asthma Allergy 2014; 7:53. ER Bleecker et al. Efficacy and safety of benralizumab for patients with severe asthma uncontrolled with high-dosage inhaled corticosteroids and long-acting β2-agonists (SIROCCO): a randomised, multicentre, placebo-controlled phase 3 trial. Lancet 2016; 388:2115. JM FitzGerald et al. Benralizumab, an anti-interleukin-5 receptor α monoclonal antibody, as add-on treatment for patients with severe, uncontrolled, eosinophilic asthma (CALIMA): a randomised, double-blind, placebo-controlled phase 3 trial. Lancet 2016; 388:2128. P Nair et al. Oral glucocorticoid-sparing effect of benralizumab in severe asthma. N Engl J Med 2017; 376:2448.